I know, I know, this movie has already been for ages in the cinema (well, 4/5 weeks), but I loved it so much, I thought I have to blog about it (and convince all you people who still haven’t see it yet to go see it). As I’ve said in some of my previous posts I’m extremely busy, mainly with organizing BarCampLondon7. I haven’t been to that many movies lately, cause I frankly can’t find the time! I’ve still got District 9 and Coco Before Chanel on my list of movies-to-watch-in-the-cinema, and this month there are loads of cool things coming out (Pandorum, Up, Fantastic Mr Fox, 9, The Imaginarium of Doctor Parnassus). All that aside, Inglourious Basterds is the latest film by Quentin Tarantino. Set in Nazi-occupied France during World War II, it’s about a group of Jewish-American soldiers known as “The Basterds” who are chosen specifically to spread fear throughout the Third Reich by scalping and brutally killing Nazis. The Basterds soon cross paths with a French-Jewish teenage girl who runs a movie theater in Paris which is targeted by the soldiers. What I found surprising of Inglourious Basterds is that while the movie is named after ‘The Basterds’ it actually isn’t really about them. Yes, they feature quite heavily in the movie, but I don’t think I’d call them the main characters. There are a slew of interesting characters that are focused on as much as The Basterds, some maybe even more. As most people who have seen the movie will tell you, one of the highlights is Christoph Waltz’s performance as Colonel Hans Lauda. His character walks that fine line between being genius and unbelievably creepy; some of his monologues are just brilliant and one of the main things that make this movie worthwhile. Like most Tarantino movies the dialogue in general is pretty topnotch, and the way Brad Pitt pronounces ‘Arrivederci’ will be imprinted in my brain forever. I liked Tarantino’s previous movies, but I must admit I always found them a bit too… bloody. Gruesome. Over the top unnecessarily violent. (Feel free to disagree with me, but I seriously got a bit squeamish with his previous films) Here in Inglourious Basterds he’s toned it down somewhat. There are still one or two ‘icky’ scenes (always with The Basterds), but most of the real gruesome stuff happens off screen. The movie has a couple of plot problems (like how does Shoshanna suddenly own a theatre? ), but I’m guessing this is because of the cuts made after the criticisms at Cannes. The problems that were reported there though, like the slow pacing, are nowhere in sight. Inglourious Basterds runs for almost 2.5 hours, but it doesn’t feel that long. Still I’d like to see a longer version to straighten out those missing story lines gaps. If you haven’t seen Inglourious Basterds, you should definitely try to catch if before is disappears from the cinemas. I loved this movie, more than Tarantino’s previous ones. And if you’re hesitant, because you’re scared it will be gory, don’t be; this is one of the mildest Tarantino movies. 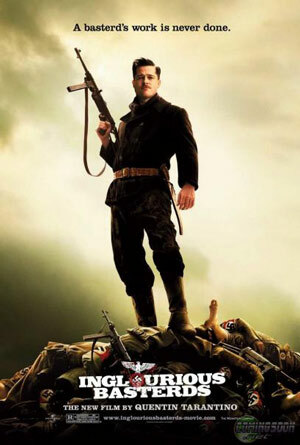 Inglourious Basterds provides a couple of hours of great dialogue, absurd plot and lots of killin’ Nazis.